Snack Girl has spent A LOT of time in the cereal aisle looking for a great choice for Snack Girl readers. It isn't easy to find a cereal that passes the Candy or Breakfast? Evaluate Your Cereal test. This YELLOW box with the heart on it called out to me from the shelf. And, my friend Katherine, asked me what I thought of this icon of American cereal. 1. Is the first ingredient whole grain? Cheerios passes with whole grain oats as its first ingredient. 2. Is sugar, high fructose corn syrup, molasses, honey the second ingredient? Cheerios passes again with sugar being the third ingredient. 3. One serving must provides at least 4 grams of fiber. You can remember this one with Four Fiber. 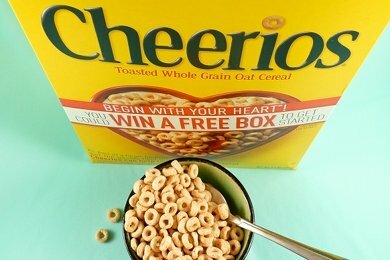 Cheerios fails - but by just one gram. It has 3 grams of dietary fiber per serving. So, Cheerios fares pretty well. It tastes a bit like cardboard to me, and it is a processed food and that means that it might not be the best for your blood sugar after you eat it. Will you get a sugar spike from eating them? Cheerios has a glycemic index (GI) rating of 74 versus old fashioned rolled oats, which have a GI of 46. A Lower GI rating indicate that a food has less impact on blood sugar levels. Basically, the more processed a food is by the food manufacturer - the more "digested" it is before it hits your blood stream. Overnight Oatmeal is a better choice, and it is cheaper per serving. But, we don't always want to eat oatmeal. Personally, I like oatmeal better than Cheerios, but I don't always have the time to make oatmeal. My suggestion is to treat Cheerios like Toast. Use it as a medium for other good stuff like strawberries. Add a little peanut butter with your milk anda banana. Pump up the nutrition of the Cheerios with other lower GI foods and I think you have a healthy breakfast. All on its own with just milk (which is filled with sugar), it is not so great. What is your favorite healthy packaged cereal and with what do you serve it? Good stuff! Love the rule of the three. What are your thoughts about foods that have fiber ADDED into them ("frankenfoods" like the Fiber One products)? I miss Cheerios since going GF. You know, it's funny how much I can notice these processed cereals and the effect they have on my blood sugar levels compared to my other breakfast standbys - oatmeal, quinoa, brown rice...I have bought a few GF processed cereals - one is kinda like Kix - and boy, does that give you a sugar spike, and it's supposed to be decent for you! (corn, evaporated cane juice aka sugar, etc) As for your idea of putting peanut butter in the milk? Great idea! As much as one might believe Cheerios is a healthier choice for cereal, the truth is, you might as well be eating Frosted Flakes. The way you body reacts when using the nutrients found in Cheerios is no different then any other commercial processed food that has very little in the way of nutrients. A quick burst of insulin and then an energy crash, that is what you can expect when you eat Cheerios. I love cereal and always have. That is why now I eat 1/4 cup of my favorite cereal and add hemp seed, ground flax seeds and almonds to boost the nutritional value and give me the energy I need to enjoy my day. I even add quinoa to my cereal a few times a week. So Good! I've been on the Spoon Size Shredded Wheat for a few years now. I eat it with yogurt (I'm working toward making my own) and toasted nuts. Bummer! I just bought these today thinking it would be a healthier snack. I eat oatmeal for breakfast almost every day, but sometimes need to switch it up or have a snack option that is not oatmeal. Cheerios always left me feeling hungry an hour later. I love any of the Kashi cereals - right now I'm stuck on their Crisp! cereal - it's very good and keeps me full for hours! Interesting analysis, Snack Girl! I was wondering how healthy Cheerios were. They seem benign compared to all the sugary cereals, but where did I hear recently that they have more sodium than Doritos? Is that possible? Cheerios has 160 mg per 1 cup - 7% of your DV and Doritos has 170 mg of sodium per 14 chips- 7% of your DV. Cheerios have the same amount of sodium per serving as Doritos. I can't gloss this over but, to me, Cheerios remain a healthier choice. Not a huge fan of cheerios as a snack, but that's more because I'm trying to avoid snacking. I do love them for breakfast though. Sure, heavy on sodium, but not nearly as bad as most breakfast cereals. Long before these new high-fiber cereals became the new 'in' thing,there was bite sized shredded wheat. I just applied your test - 1. yes, it is whole grain; 2. no sugar at all; 3. has 5 grams of fiber - AND 5 grams of protein! I do eat a lot of oatmeal (prefer the steel cut) in the winter, but like cold cereal in the summer topped with fresh fruit. I occasionally put milk on shredded wheat, add a few dried cranraisins & slivered almonds, and put in the micro-wave to heat up for a change of pace in the cold months. I'm a cereal-lover, so really appreciate the new trend to high-fiber, healthier cold cereals - but not the "frankenfoods'(love that expression!) variety with added fiber. Kashi and Cascadian Farms Organic have some good dry cereals worth considering. If the question is are Cheerios a healthy choice then the answer is definately yes, but if your going to say is it the best choice compared to extremely healthy foods that nobody likes then... I agree Cheerios are processed, and pretty much anything that’s processed isn’t as good as its raw alternatives, but most people eat instant oats which are loaded with sugar. People like snacks that are fast and easy, so what if Cheerios aren't as healthy as a wheatgrass drink or slow cooked organic oats, they're still healthy. Cheerios have only one gram of sugar, only one gram, that’s almost as good as going into a field and eating oat grains, but since I’m not a horse I’ll choose cheerios. Oh crap I rolled the bag up and closed it, soon as I saw this. :( Cheerios is a rip off. Cheerios are still the bomb. I used to love making party mix using cheerios and pretzels. I could thread a bunch of cheerios on a pretzel and eat all at once. Now the cheerios shrink to a size that they now longer can be threaded on a pretzel. Something changed in the cheerios.